The good life: a fenceless pasture, a verdant tray of food surrounding you, underfoot everywhere you step, and your job is simply to eat. 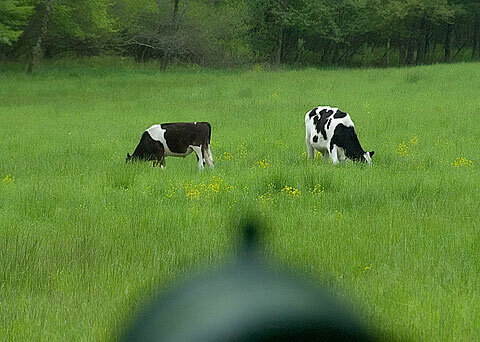 In this case, we don’t know for sure, but this peaceful scene (aimed over the “sights” of our mailbox) may have been one of the last meals enjoyed by these two bovines. The new neighbors to whom these two head belong discovered after two days that they were loose, found them in our pasture, and decided “tomorrow” would be soon enough to come fetch them home. They were not to be found, and they have not appeared back inside the unconfining confines of their poorly fenced pasture ever since. Hamburger, anyone? Ah, and there’s another advantage of the sturdy fence around the garden. Once when we lived in the Wytheville area and had a garden 10 times the size of ours today, a neighbor’s 500 pound pig got loose and breached our fence and helped itself to a vegetable buffet. What it didn’t eat it stomped on or bulldozed with its porcine mass. Let’s see you try to get into our garden NOW! That is a menacing-looking mailbox and a natural fit for your storyline! Your last line leaves something for my imagination, which was rooting around with machine-gun nests, barbed wire, and searchlights. Two head of cattle is a mighty expensive investment to disregard. I’d be forever grateful of a neighbor telling me my livestock was in his place. Besides, if you were, shall we say, lacking in character, those cows could very easily have shown up missing.